Skeptics of Makerere University’s innovation drive are in for a new shock. Last Friday’s formal launch of MV Mulimif the multi-purpose vehicle, already has many wondering when the first one will be available for purchase. 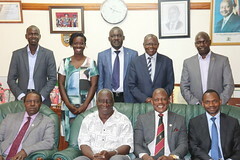 MOSES TALEMWA met the team behind MV Mulimi. Last week, a group of farmers from Nakaseke arrived at Makerere University’s Agricultural Research Institute Kabanyoro (Muarik) with a lot of anxiety. Some like Steven Mukasa were wondering if the scientists from the university’s college of Agricultural and Environmental Sciences (CAES) had made a crop discovery that would solve some of their concerns about crop varieties. Instead, they were met with a three-wheeled vehicle, which they were told would resolve most of their problems. “Not necessarily the problems we were thinking about, but some of those we have gotten used to,” Mukasa said. On a hot sunny morning December 31, 2015, they met technicians making their last preparations before unveiling MV Mulimi, the latest addition to efforts to improve agriculture in Uganda. According to Dr Nicholas Kiggundu of CAES, the vehicle design is the ultimate in value addition, as it attempts to solve the farmer’s problems at source, following a demonstrated need for low-cost technologies in farm field operations and post-harvest handling operations. “It will resolve the kind of problems that made farming a preserve of the resilient and those with no options, yet it is doing this at a low cost,” he said. The MV Mulimi was developed by a team from CAES, consisting of Prof Noble Banadda (as principal investigator), Prof John Lumkes (Purdue University), Dr Ahamada Zziwa, and Dr Nicholas Kiggundu of Makerere as well as Tyler Anselm (Purdue University), and technicians Ernest Tibaku-Zira, Samuel Mutesasira and Denis Nsubuga. Apart from Prof Lumkes and Anselm, the rest of the team are from Makerere. The idea of a low-cost multipurpose vehicle suitable to African conditions, came out of a trip Prof Banadda took to three US universities in 2013. Prof Banadda, who was looking for research collaborations with US institutions, visited Purdue University, University of Georgia and Iowa State University. On his return, Prof Banadda considered his options. Then, in June 2015, the dean of the department of Food Science and Bio Engineering Systems, Prof John Muyonga, challenged his team to come up with such a vehicle. The design and development of MV Mulimi took place at Muarik under the sponsorship of the Presidential Initiative on Science and Technology from September 1, 2015, for six weeks. As Dr Kiggundu explains, the process was fast-moving, but filled with numerous challenges. This story was sourced from allAfrica: http://allafrica.com/stories/201601042218.html.